As we all know I can be totally lazy when it comes to painting my nails and so anything that can help speed up the process and make it a little better then I need it. I have so many nail polish shades, I don’t often find a favourite as I’m always trying a different shade out and so I left that one out but the rest, trust me they’re goodn’s. Starting with the nail filing and I’m talking Styfile. The curved nail file I really didn’t expect I’d like but surprisingly I do. It actually makes filing your nails so much easier and I love the nail skimmer and cuticle pusher on the end of the one pictured. This is actually the Stylfile 2* and is one of the prototypes, I haven’t actually got my hands on the actual one yet, but if this is good enough to go by, it’s blooming amazing and I’ve been using it a lot this year! 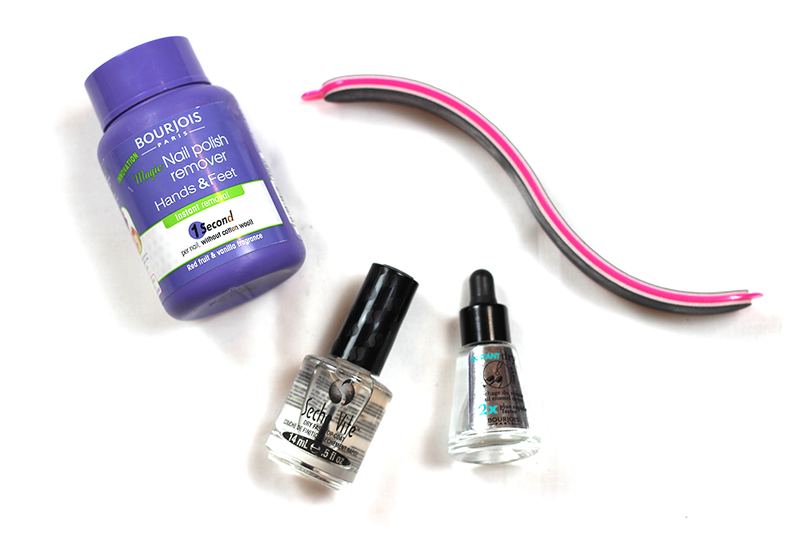 The Bourjois Magic Nail Polish Remover Hands and Feet* is just insane. I have the chore of removing the nail polish, I mean as I said applying it even feels like a chore. This takes out all of that ‘chore-ness’ and I am forever picking up a new pot of this each time it runs out. To finish of my mani, there are 2 products I always reach for to ensure the finish is amazing and to make sure it dries as quick as possible. The Seche Vite Top Coat makes every mani’s finish amazing and it makes it dry that bit quicker too. On top of that, it makes it last that bit longer, and of course that means less time to the next mani. On top of that, to speed it up that bit more the Bourjois Instant Dry Nail Drops* is a godsend. A drop on each nail and honestly it really helps and does really work. What products have you been loving for your nails in 2014?